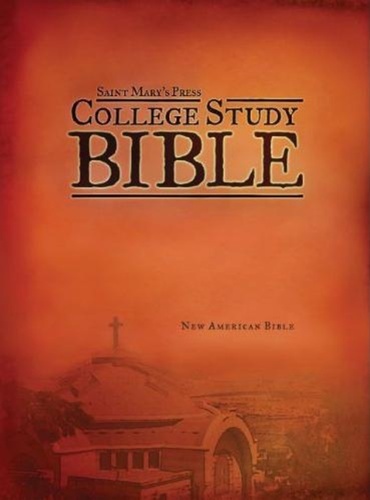 My friend Paul, at the Pastoral Center, is offering a pretty massive discount on the Saint Mary's Press College Study Bible which utilizes the pre-2011 NAB. Each of these editions are on sale for $5.00 in their softcover version. I own one and appreciate that it does include a ton of extra information and articles. Although it is intended for college students, I think it could also be used for high schoolers as well. 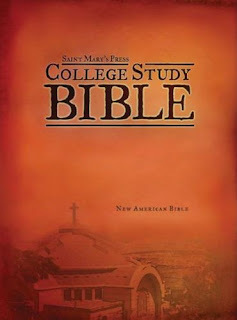 Additional study aids, including a glossary of biblical terms, table of Sunday lectionary readings, and biblical history timeline. Ugh, really indecisive 🤷‍♀️. On the one hand I would love to see the notes. But on the other hand, I can't stand the 1970/91 OT. Given how much the current lectionary draws on the 1970 NAB OT, there is a real value to having an annotated edition of that translation. Thanks for letting us know where we can get ahold of one! Mark D., if I recall correctly, this Bible has some one page articles but only the usual NAB notes. I saw one in a used book store and was not impressed. An old copy of the Oxford Study Bible in the NAB would be a better buy and they are all over the place at cheap prices now. Perhaps, but this is a new 1970 NAB OT with 1986 NT. Not a used bookstore edition. I think it could be worth getting because of its continued relevance, as I pointed out above. And to expand on my earlier remarks, the 1970/86 NAB stands not only as the base text for the Latin Rite lectionary, but as I found out this weekend, it also serves as the base text for the Byzantine Rite lectionary here in the US. My wife and I attended the local Byzantine Rite parish (Ruthenian) in our area this last Sunday, and as I looked through their hymnal/missal in the pews before the start of Mass, I saw that the base text for all scripture readings as the 1970/86 NAB (except for the Psalms, which were from the Grail Psalter). So, whether you are at Mass according to the Mass of Bl. Paul VI or the Divine Liturgy of St. John Chryostom, in the USA you are hearing, largely, the 1970/86 NAB. That makes having a new copy of the 1970/86 NAB worthwhile for those interested in studying the lectionary readings. And it's $5 brand new! It makes me wonder if it would be possible for a publisher to issue a new edition of the 1970/86 NAB for current use. Since the translation remains the base translation for the liturgy (western and eastern) for Catholics in the US, why wouldn't it make sense to have an edition available for purchase for those who wanted to read scripture in as close a conformity as possible to the text found in the lectionary? I currently own two copies of 1991 NAB and four copies of the NABRE, not including study Bibles and commentaries, so I can't really justify buying yet another copy of the NAB.